Enter: Livewire! The next blockbuster chapter of Valiant’s chart-topping, fan favorite new series slams into overdrive as Valiant’s machine-wielding heroine takes command of the X-O Manowar armor! Story– On the downed ship Livewire experiences true bonding with the Man-O-War armor. She manages to save the team before surrendering the armor to Harada. 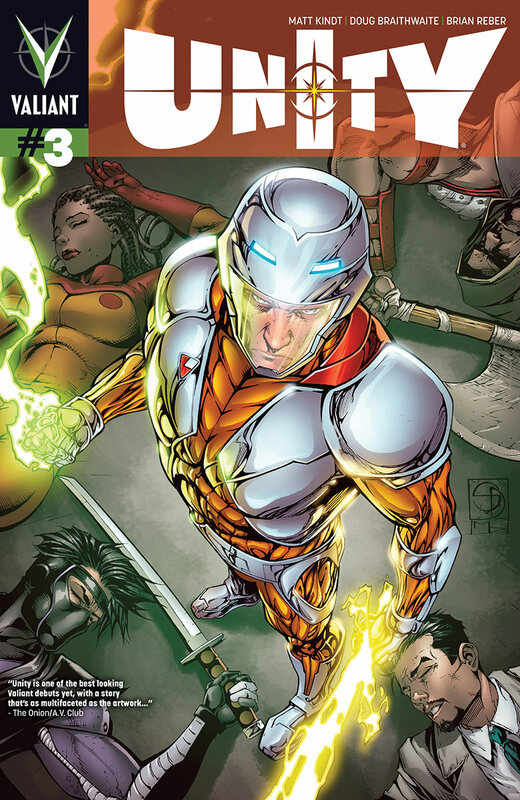 Livewire’s brush with the armor expands her powers and after she realizes the depths of Harda’s depravity she contacts the Unity team to take him down. 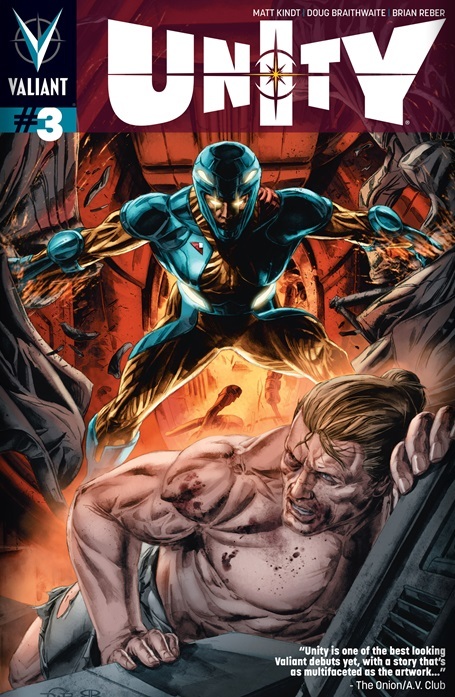 Cover– Aric lays bloody and beaten on the floor while Livewire rips a door open behind him as her eyes glow with rage. Bellowing flames engulf the ship behind her. It looks freaking awesome! Black Hero– This issue we get even more of the back story for Livewire. I’ve said it before and I’ll say it again Livewire is the best black superhero Valiant has out right now. My love for her is now approaching Mike Leroi status. Through her bonding with the alien armor new readers are given a firsthand experience of the sheer magnitude of what the armor is and can do. Action– Nuclear warheads, flying fists and exploding hulls, yes, you action junkies will be happy. Art– Doug Braithwaite’s distinctive and gorgeous art is something I look forward to every single issue. There is this almost painted nature that really makes it stand out against everything else on offer from everything else. While story is good you really have to give the art team their props for bringing said story to life. The splash page illustrating the bonding process deserves special mention. The colors from Brian Reber add so much depth to the artistic tapestry. The flashbacks and blurred edge panels really pull the reader in to experience what Livewire is and that deserves praise. Chemistry- The team works well together and have an almost palpable chemistry. We have the honor bound wildcard that is Livewire, the megalomaniacal Asian psiot Harda to the highly trained Ninjak and the immortal Gilad. There is something unique and different about their team dynamic. I can’t quite put my finger on it though. Things to Come– The next threat this team faces is none other than Harda…….from what we’ve seen in Harbingers he’s willing to sacrifice everything for self preservation and as a result taking him down will be far dirtier than dealing with Aric. How will he react to Livewire betraying him again? Questions- What happens to Aric and his people? That question is left unanswered. Consequences– Livewire alludes to their being consequences as a child for her actions, it’s neither shown nor stated…was this verbal or physical abuse? both? Something more? It was quite vague.